But the numbers suggest that the stock market collapse — it’s down 32 percent in four weeks — may be less a shocking turn of events and more an inevitable correction in a market that featured many of the classic signs of a financial bubble. The data, though, suggest that the market declines thus far aren’t as outlandish as the Chinese government seems to think. The Shanghai composite index began an upward tear in late 2014, soaring 151 percent from the start of July last year to the June 12 high. The chart shows how easy it is to frame market data in a way that sounds either scary or benign, depending on your inclination. 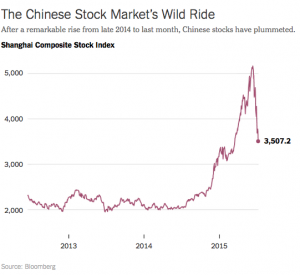 “The Chinese stock market has dropped 32 percent in a month” is scary. “The Chinese stock market is up 70 percent over the last year” sounds great. Both are true.